Soni Simpson, associate professor of business administration at Elmhurst College, presents during the ABCs of Gens Y and Z symposium on March 1. The most recent generations of women and men to enter the workforce—members of Generation Y (aka Millennials) and Generation Z—have expectations about careers and life that vary widely from the Baby Boomers and Gen Xers who currently hold more of the leadership roles. Generations Y and Z also are different from each other and don’t appreciate the labels they’ve been given. But the experiences that shaped the two younger generations, especially their early exposure to digital technology, distinguish them so much that employers and marketers need to better engage them where they are—or risk losing their contributions as employees, colleagues and consumers. 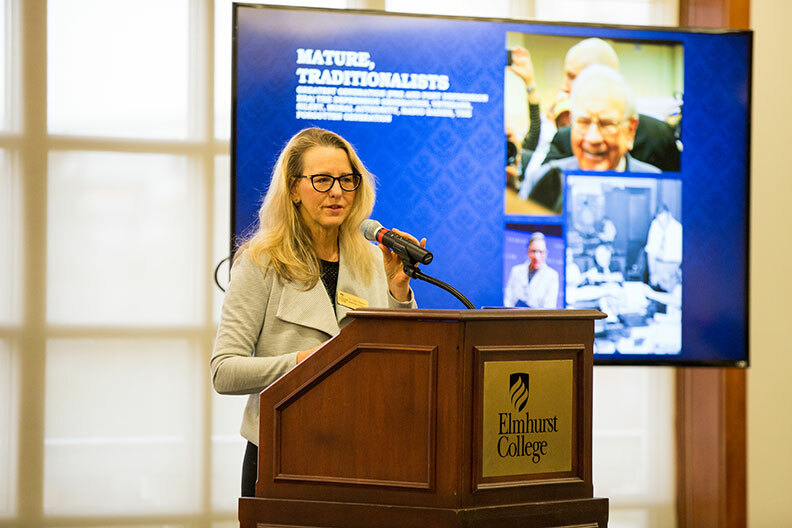 Those were some of the messages that came out of The ABCs of Gens Y and Z: Engaging and Employing Our Future Leaders, a symposium hosted on March 1 by Elmhurst College. Nearly 200 people from the local business community and the College attended the symposium, whose goal was to help both current and future workers and leaders appreciate not only their differences but also the opportunities to work together across generations. Soni Simpson, an associate professor of business administration at the College, led off the program by defining the four generations currently in the workforce, and some of the forces that shaped them. Baby Boomers (born 1946−64), also known as the “Me Generation,” were the first to see dual-career families, and tended to earn high incomes and achieve higher levels of education than their parents. For members of Generation X (born 1965−80), also known as the MTV Generation, dual-career families became the norm. This also was the first generation of “latchkey kids,” who came of age in an environment with periods of high unemployment and corporate downsizing. Generation Y, or Millennials (born 1980−94), are the most affluent generation, with $200 billion in annual buying power. They were raised at a time of economic expansion and in an increasingly digital world. They also are the largest generation in the workforce. Members of Generation Z (born 1995−2010) are also referred to as “digital natives” because computers, the internet and mobile phones have always been part of their world. They know they are living in a time of global unrest and economic uncertainty. In the workplace, a supportive culture and a healthy work-life balance are priorities for both Generations Y and Z—in some ways more than money, said Jen Ullrich, system director of talent acquisition and development at Edward-Elmhurst Health. Both generations thrive in environments that offer remote work options and flexible hours. Among Millennials, job-hopping is common, so employers should be prepared to help them transfer their skills to other departments within their organization. Generation Z employees value fairness and expect a corporate culture that prioritizes equality, diversity and inclusivity. Millennials saw the rise of the widespread use of the internet, social media and smartphones, making them pioneers of the digital age—quick to learn the tools of technology and apply digital solutions to everyday work problems, Ullrich said. Because Generation Z was born into the technology, they’re able to work with it instinctively. Digital technology also is key to marketing to Generations Y and Z as consumers, said Stephanie Pursley, associate media director of the Lipman Hearne marketing and communications firm. Both strongly associate the internet with how they communicate and express themselves, get their news and entertainment, and conduct research and make purchases. But regardless of the generation, people have a basic need for connection and belonging, and for finding fulfillment in their work. “This need to belong crosses cultures, race and other identifiers, and is much greater than a generational thing,” Ullrich said. During a panel discussion at the end of the symposium, the panelists—all members of Generations Y or Z—agreed that society could be more successful if the different generations could be more empathetic and focus on what they have in common. View slides from the presentations (available until May 3, 2019). The ABCs of Gens Y and Z symposium was sponsored by the City of Elmhurst and Elmhurst College Commission; Community Bank of Elmhurst; Elmhurst College; Admiral Heating and Cooling; the Elmhurst Chamber of Commerce & Industry; the Elmhurst Economic Development Commission; and John Noldan, EVP of Mortgage Lending for Guaranteed Rate.